Hello! So the day came, when there was no Privatbank sets new technological trends. On the Ukrainian market an entirely new bank – MONObank. Without physical offices in the city! Yes, Yes, We were not wrong. MONObank positioning itself, as the first Ukrainian internet bank without branches. It is truly mobile banking. What You Should Know, to get a credit card MONObank – Universal Bank ? 1. Step one. 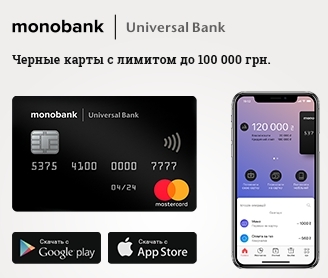 Set official app on your smartphone from Adroid Google Play or visit the official website https://www.monobank.com.ua/ and clicking on the link to download the app. 2. Sign up in the app. You will be prompted to download documents: passport and TIN. 3. Within one hour, You will receive a message about the result of the check. After this test,, You will immediately be informed a credit limit that you install. If you have a bad credit history vseukrains'ka, then maybe you will not give credit. In such cases, the card can be used as a debit card. Interestingly. Our site has been tested. We have installed the application on a day off, approximately at 19:30 evening. An hour later, I took the card with a credit limit of the manager issuing point. In our case, there was a point of issue in the near shopping center. 4. Pick a card from the dispensing point. The address you will find in the annex. – Quick opening card. No need to stand in line. – Many different cashback . Every month change. – Big grace period. To 62 day. – Free replenishment of his card through Ibox terminals. – The card can be opened only in the national currency. – There is no foreign currency deposits. but we think, these deficiencies will finalize in the coming years. In monobank no internet banking for desktop. There's only mobile application! Previous recordPay communal card PUMB online Next recordHow to recharge monobank no commission? There's an answer!